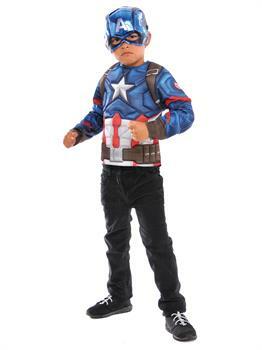 Keep America's colors flying proudly with the Captain America Deluxe Costume Top Set. Nothing will threaten freedom when your child is dressed in this high-octane superhero look. Only half the jumpsuit but all the attitude. Captain America's signature half mask shines in blue with its winged emblems and bold A front and center. Wearing the starred armor will keep them safe and show off our nation's colors. Be prepared for anything with the utility belt and shoulder harnesses. The Hulk, Black Widow, Iron Man and Thor are ready for battle, get your kid the costume they need to join in!Get ready for the most handsome and brave Superhero of this millennium. Be a real threat for your enemies and dress up like your favorite Captain America with shield. Show your Superhero love with Captain America outfit and get ready for real action. Get dressed in the amazing Captain America Deluxe costume.